It’s been quite some time since our last post at 3GW. Blame it on a very busy work schedule for the past few months. Once things die down, we will be back to doing some regular posting so please don’t forget about us. In the meantime, and to keep my sanity amongst all the work that surrounds me on a daily basis lately, I decided to lay down some hotness for those that are a fan of the mixing of the one and only DJ Supreme Soul. Here is some music that comes mostly from my home state, specifically 2 cities I’ve had the pleasure of residing in for some years. 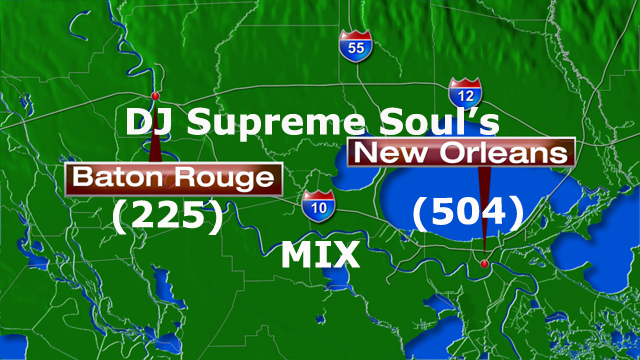 Baton Rouge aka “The 225” and New Orleans aka “The 504”. Featuring some classic southern Louisiana hip hop from these respective cities, this mix will definitely take you back a decade or two if you’ve had the pleasure of hearing them before. If not, sit back and enjoy the gift of hip hop from “The Boot”. After all, we are known for our southern hospitality down here.